One seat. One ticket. Infinite sellers. New York’s top attorney is probing a widespread, but little known tactic used by ticket scalpers to rake in cash even before they buy up Broadway seats. The practice involves posting ads on re-sale websites that promise seats to buyers -- before the sellers even have the tickets in hand. Once a buyer pays for the tickets, a short seller tries to track down the seats for a cheaper price –- and pocket the difference. 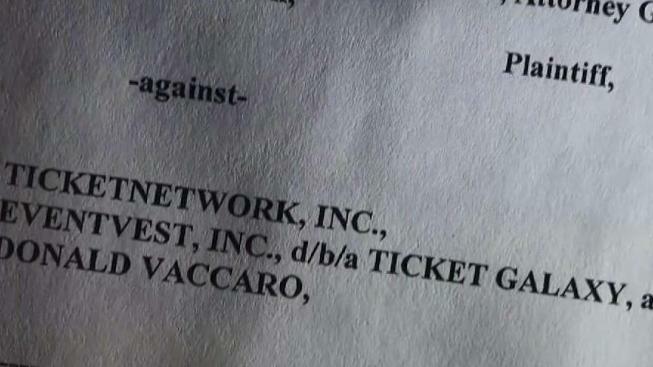 The lawsuit alleges that TicketNetwork’s own business records show thousands of customers failed to get the seats they ordered because they were responding to sellers who didn’t really own the tickets. The complaint also claims customers often pay more for speculative tickets than they would otherwise pay for real tickets. Barbara Server, a theater-goer who bought tickets to the Broadway production of "My Fair Lady," believes she is a victim of deceptive short selling on TicketNetwork. Last summer, Server says she purchased five seats in the orchestra section of the musical, but when she opened the envelope at the theater, she discovered she actually had nosebleed seats. The tickets were supposed to be a birthday gift for her daughter, Lauren Scher. “You’re sitting in the dead last row in the theater, and you’re looking at a ticket that you really feel scammed,” Scher said. Peter Harvey, an attorney representing TicketNetwork, said the company is carefully looking into the complaint about those "My Fair Lady" seats. But he said TicketNetwork vigorously defends users’ ability to place traditional ads –- where sellers already own tickets, along with speculative ads –- where sellers don’t have the seats yet. While TicketNetwork publicly touts the consumer benefits of speculative sales, an internal document included in the attorney general lawsuit seems to show the company views short selling as a way to achieve higher average prices and generate higher fees. To demonstrate how ticket speculation can tend to inflate the price of seats, the I-Team tested the market. On Ticketmaster we bought the only two seats left in Row G of last Friday’s production of Broadway’s "Pretty Woman." The cost was $541 with fees. Then we logged onto TicketNetwork and found someone still selling in Row G – even though we just bought the last seats in that row. The I-Team bought that pair for $1,378, a mark-up of 150 percent. And when the tickets arrived in our email – they weren’t in Row G. They were in nearby Row F, suggesting the seller didn’t actually have Row G tickets in hand. The tickets that ultimately sold for $1,378 on TicketNetwork were originally issued to a New Jersey ticket broker named Michael Leshinsky. When the I-Team contacted Leshinsky, he suggested those seats had exchanged hands more than once before they made it to the I-Team inbox. “I did not sell these tickets on the TicketNetwork exchange,” Leshinsky wrote in an email to the I-Team. He said he doesn’t know who re-sold the tickets after he first sold them, but defended the practice of speculative seat sales. John Breyault, of the National Consumers League, said short-selling Broadway tickets is more troubling than short-selling the stock market. “Let’s be honest here, your average ticket buyer is not as savvy as a Wall Street trader,” he said. Gov. Cuomo recently signed into law a bill that would require ticket re-sellers to notify customers when they don’t have in hand the seats they are advertising. Breyault says other states and the federal government should adopt similar provisions. But he says the practice of short-selling is just one issue that tends to drive up ticket prices. NCL is also lobbying Congress to force event promoters into disclosing how many seats they “hold back” from the general public – by reserving blocks of tickets for preferred brokers, fan clubs or other insiders. Ticketmaster has voiced staunch opposition to the practice of short selling seats, but the ticketing industry giant opposes rules that would force disclosure of “hold back” seats. A Ticketmaster representative sent the I-Team an email stating that mandatory disclosure of seat inventory would be unfair because other industries aren’t forced to disclose their product inventories. Ticketmaster also suggested scalpers could use knowledge about inventories to gain more insight into scarcity, and possibly drive ticket prices up further. Last summer, investigative reporters for the CBC posed as ticket scalpers and found Ticketmaster representatives at a Las Vegas convention appearing to encourage the use of ticket-buying bots and fake identities so large blocks of tickets could be re-sold for higher prices and fees. At the time Ticketmaster President Jared Smith insisted in a blog post that Ticketmaster is a leader in the fight against scalpers. “Ticketmaster does not have, and has never had, any program or product that helps professional resellers gain an advantage to buy tickets ahead of fans,” Smith wrote.